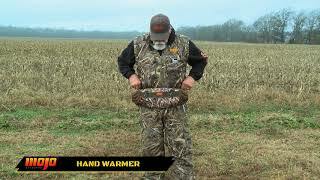 The MOJO® Handwarmer was crafted with a durable water resistant material in the Mossy Oak® BLADES camo with a fleece interior, maximizing comfort and convenience. The fleece lined, moisture wicking material on the interior keeps your hands warm and dry. Use the built-in clips to hang on your waders or use the adjustable waist strap to securely attach to your waist.